China, while not as golf crazy as its South Korean neighbour, is developing an infatuation with the game. Though the crowds at the HSBC Champions PGA event and the BMW Asia Open in Shanghai do not compare to equivalent events in Europe and North America, they are growing and new courses are being built to meet the growing demand. Currently, however, golf is still very much a sport generally reserved for the upper class in China, particularly in cities like Shanghai where real estate prices make the cost of a game on a full-size course prohibitive for middle-class Chinese. This is not to say that average Chinese do not participate but as a proportion of the overall population, their numbers are miniscule. In Shanghai you will find a number of driving ranges and golf courses, both private and public, that cater to those looking for a world-class experience, as well as those looking for a 9-hole pitch and putt. As in many Western countries, golf is a sport that has evolved into an important business tool. In China, a game of golf can be the key to securing a deal or solidifying a developing business relationship. Keep in mind that the concept of face applies. Dealing a crushing defeat to your potential business associate may not be the easiest path to a successful relationship. 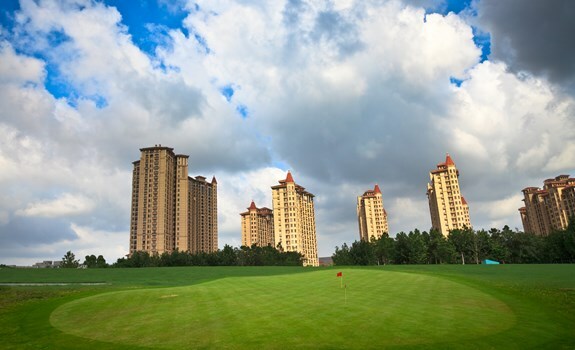 A number of luxury golf villa developments exist in Shanghai, catering to those who want to live near their passion. The private courses situated on these developments are usually well maintained and not used much. If you can afford one of these residences, they amount to a golfer’s paradise. Upon visiting one of the many tourist markets, avid golfers will immediately be drawn to stores offering name brand equipment at prices that seem hard to refuse. As with much of the sports products offered in these markets, the quality may be suitable for occasional use, but if you are serious about your game, you will want to bring your own set from home as prices for legitmate equipment in Shanghai are noticably higher. Shanghai Golf Club is a members-only course that features water on 16 of 18 holes. Situated about 50 km from downtown Shanghai, this challenging course has a driving range, pro shop and Japanese restaurant on site. Designed by Peter Thompson, Binhai’s Lakes Course offers a challenging links-style experience. Deep bunkers and prevailing winds ensure pars will not be easily achieved. The tree-lined Forest Course adds a nice complement for golfers seeking a day of contrast. Designed by Robert Trent Jones, this set the standard for its competitors when it opened in 1990. In addition to the par 72, 7025- yard course, Shanghai Country Club includes leisure facilities, a driving range and a three-hole mini course. Though private, non-members may play on selected days. If you can find a way around the members-only policy, this is an essential stop on your Shanghai golf circuit. Tomson has hosted the BMW Asia Open for the past three years and offers challenging obstacles set against the dramatic Pudong skyline.